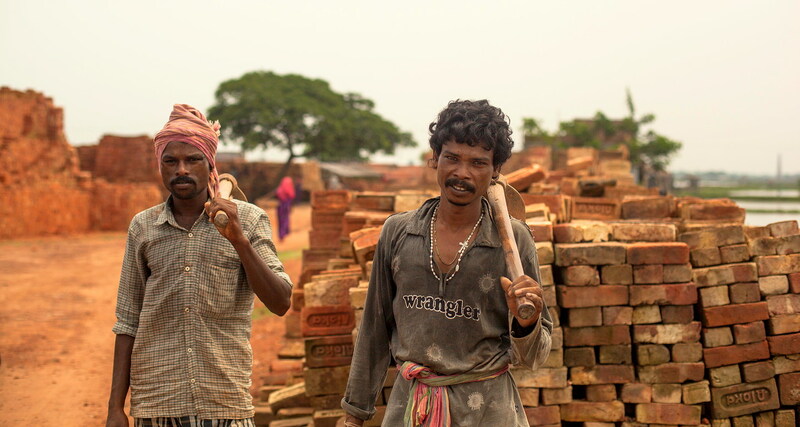 Told without subtitles or explanatory narration, Robert Mentov’s Bricks of Bengal documents the lives of the migrant workers who settle in the Sundarban Islands to make the vast numbers of bricks needed in the construction of the buildings of India. We asked Mentov to tell us how he transformed his passion for discovery and inquiry into a compelling and relatable documentary about people and their experiences. The initial concept for Bricks of Bengal came to life organically. I was in Kolkata with a non-profit and we were heading over to the Sundarban Islands; an area known to have a high number of brick kilns. It was out of season so I didn’t expect to see anyone in the brick kiln or the village. Once we arrived, there were actually quite a lot of people working. Not actually making the bricks but clearing the path of old ones. With these sort of documentary vignettes, I always try to be conscious of the potential story to be told but I also like to keep enough of an open mind to find the story through the editing process. Everything was shot over the span of a day. It was mainly shot handheld using a Canon 5D with 50mm 1.4 lens, a rode videomic, with some steadicam and some tripod shots. I wanted to keep the camera relatively loose to give the viewer a more visceral and engaging experience; almost as if the camera was a character being lead through the Islands. I think that a lot of those moments can be missed on a tripod or monopod glued to the ground. Once the editing began I started noticing the abundance of sound in the footage. The chopping of wood, sounds of the loud boat and bricks being thrown into a basket. I wanted these sounds to really help lead the viewer through the scenes, as opposed to setting music as the primary sound. The premise of the film was to show a glimpse into the lives of the people living in the Sundarban Islands as opposed to teach people about it. I’m ignorant to world issues and I don’t want to pass on western judgement. I’d prefer to show people, through visuals, the lives and allow for people interested to maybe research more on the subject. So much biased information is thrown at us daily that I want to keep these sorts of videos as pure as I possibly can.